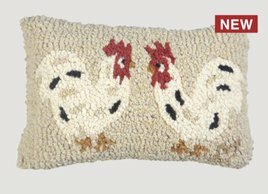 A whimsical addition to your farmhouse style is the Two Little Hens Hand Hooked Pillow. A quality hooked accent pillow for your country bed or in a chair. Designed by Laura Megroz. 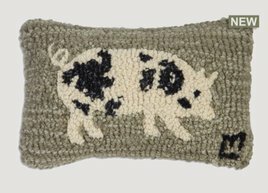 A perfect accent for your country and farmhouse style, the Spotted Pig Hand Hooked Pillow. Perfect on your favorite chair or atop your favorite quilt in a bedroom. Designed by Laura Megroz.